Before. A ‘hard’ bulkhead severs ecological connections. Wave energy, left unattenuated, ricochets back into the water. This scouring action is hostile to riparian life. Fertilized greensward contributes to nutrient run-off, favored by geese, their droppings create unpleasant conditions for people. A ‘Living Shoreline’. A gentle slope from the water to land allows for wave action to be dissipated. 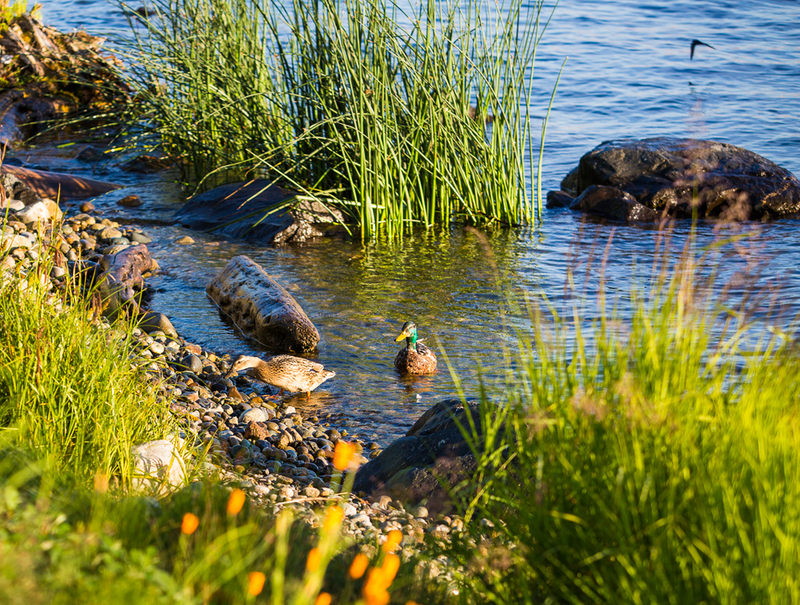 A living shoreline is a defense from erosion and can provide important habitat for fish and wildlife. 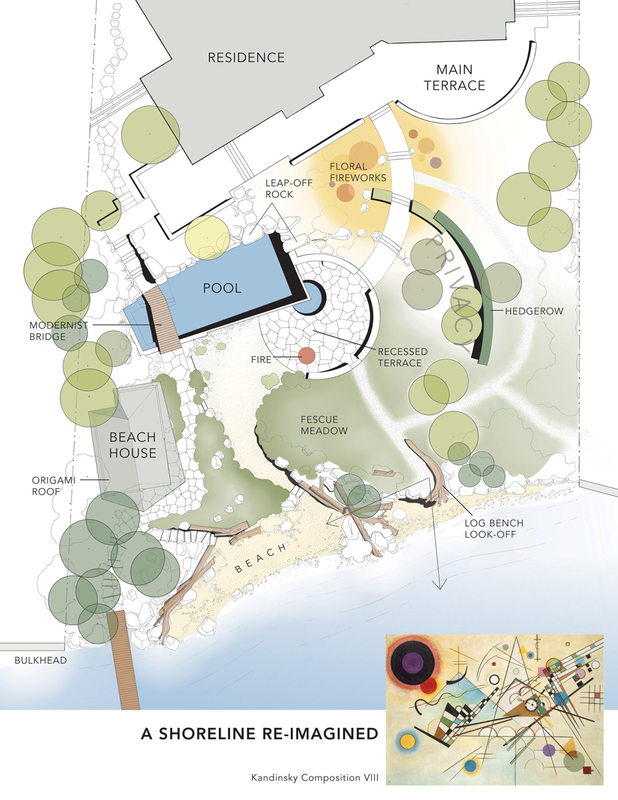 The new Beach House was seen as a key component of the Site Plan. 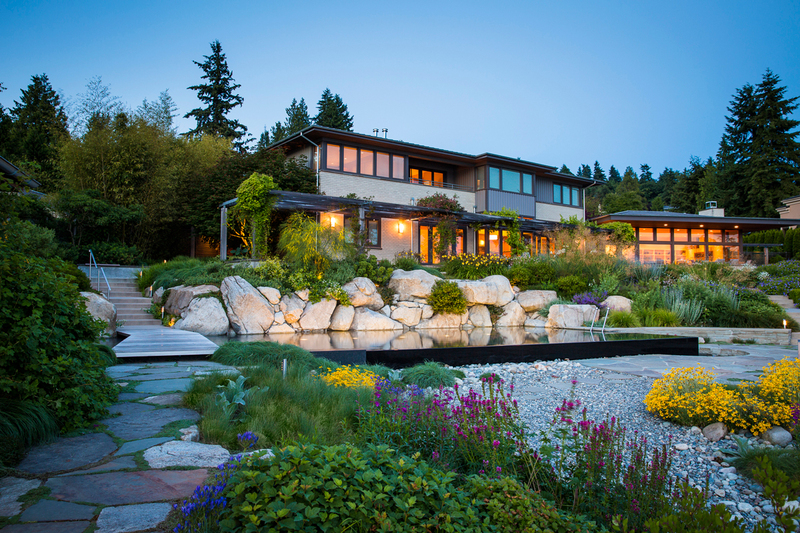 Designed to have a better relationship with the new shoreline, it also shares a close connection with the Pool, Round Terrace, and Fescue meadow. How can an urban landscape, with clearly defined boundaries, transcend those boundaries and connect to the uniqueness of the region? 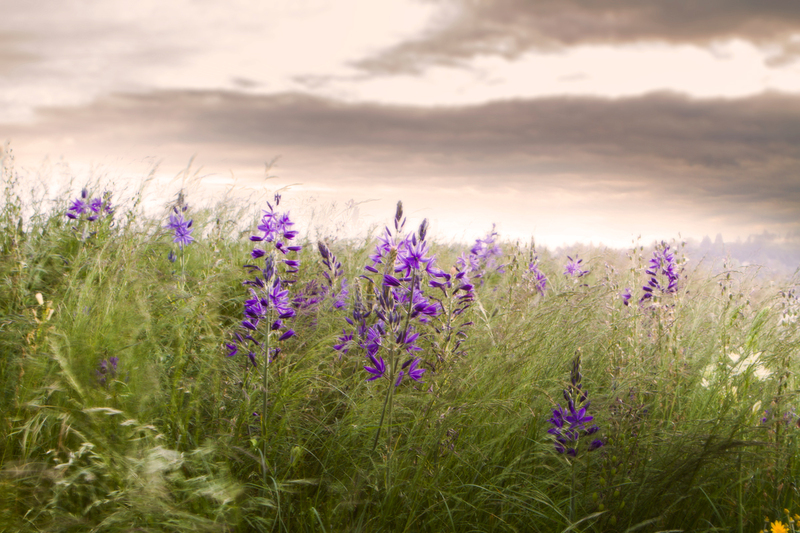 A native Roemer’s Fescue meadow, studded with wild camassia, references regional lowland meadows, now endangered throughout much of Puget Sound. Extensive re-grading has created a more playful and engaging relationship between Beach House and view. 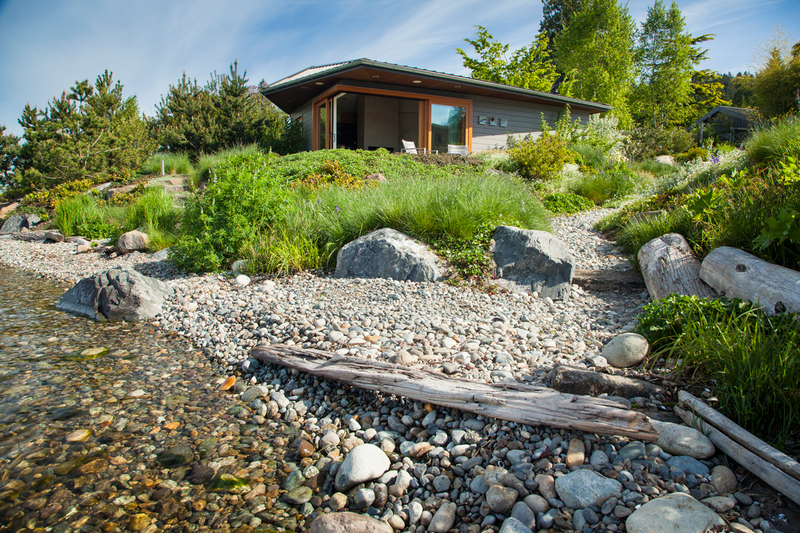 By extending the beach deep into the design — in the form of a recessed sloping pebble path — the structure has gained a sense of prospect. 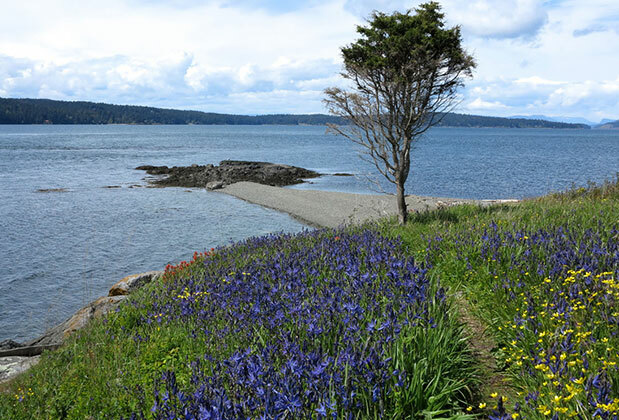 The approach to the beach narrows intentionally, restricted and obscured by the new landform and native plantings. 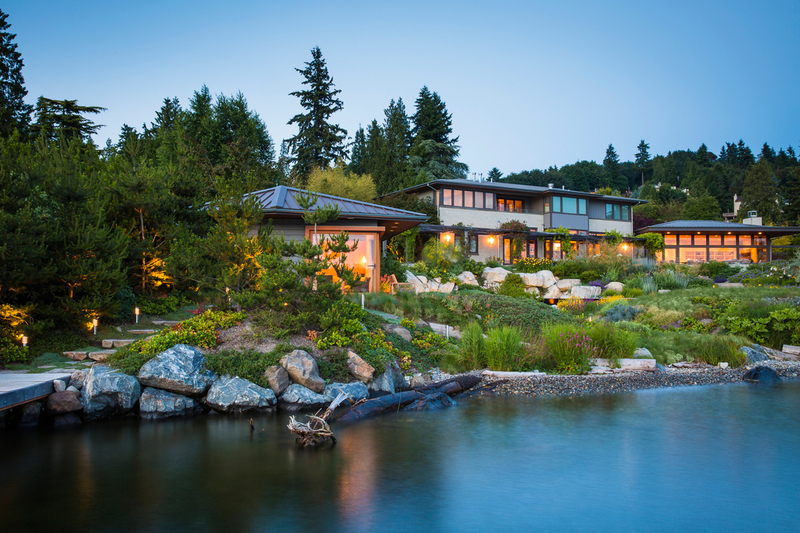 This builds anticipation and allows for the shoreline to have its own subtly distinct place in the design. 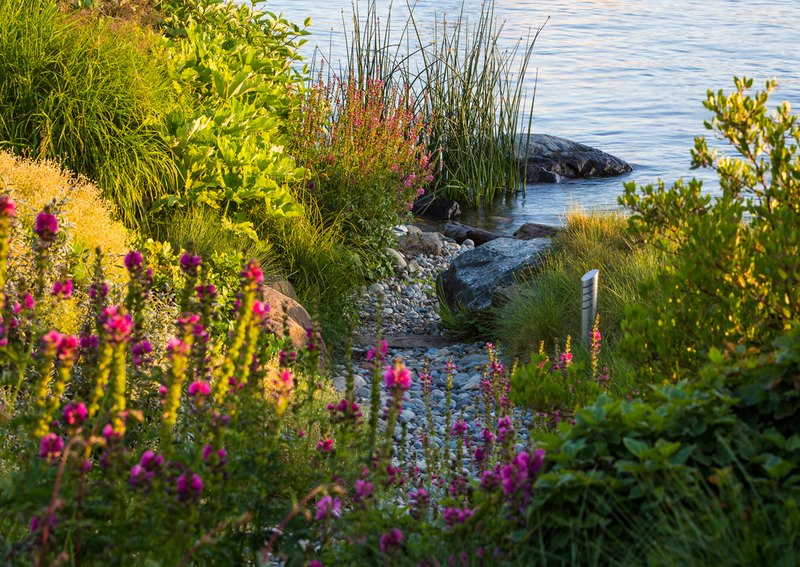 The new shoreline – a scene composed entirely of native plants. To encourage fish spawning, state regulations dictate that the beach must be comprised of rounded, size-specific pebbles laid down to re-create the way they would naturally sort. 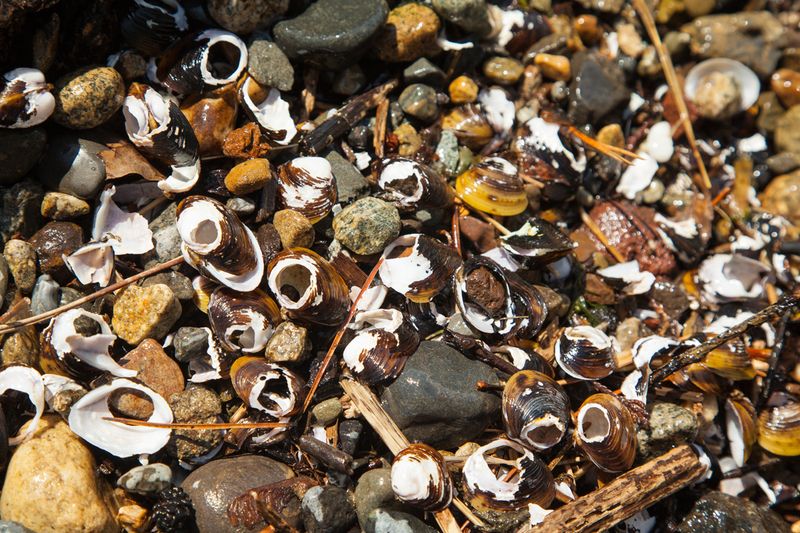 The newly created shoreline has created new shore life, as evidenced by freshwater mussel shells and a predator that is feeding on them. Freshwater crayfish have been discovered in the reeds and otters now make it ashore. View From Beach House. 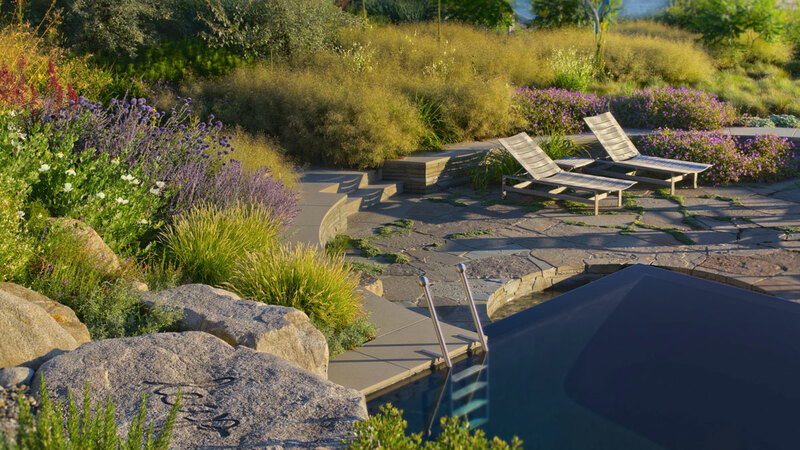 The pool and associated terrace occupies a crossroads between the Residence, Beach House, and Shoreline, all linked by pathways. 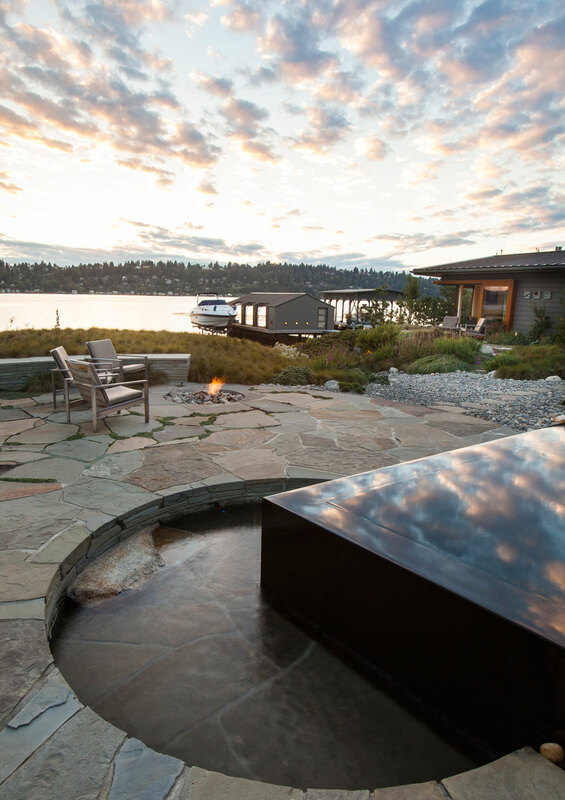 The beach starts to make its presence known with cobble extending up to the pool edge. 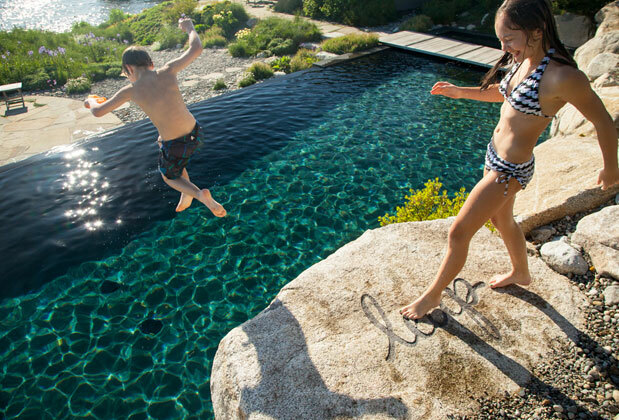 Grandchildren, Tilden (airborne) and Kalindi, at the Leap-Off Rock. 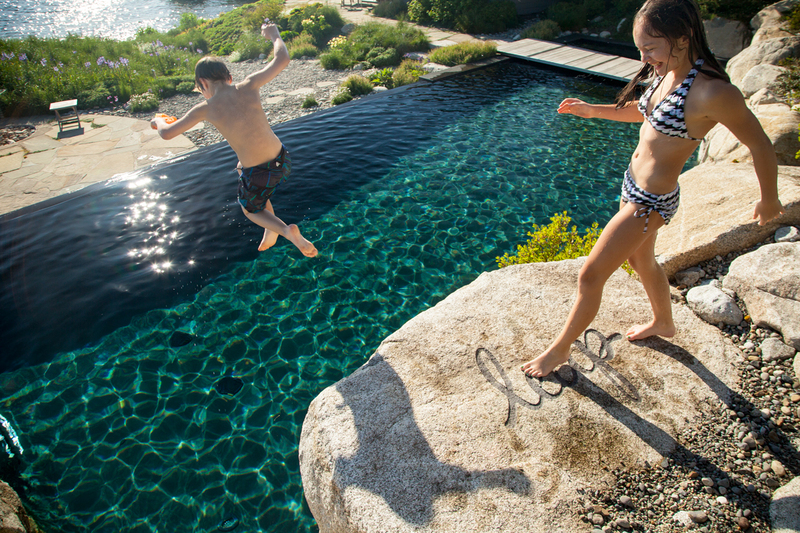 The words “Look Before You Leap” have been inscribed on four hand-selected boulders. The Modernist Bridge leads to the Beach-House and beyond. 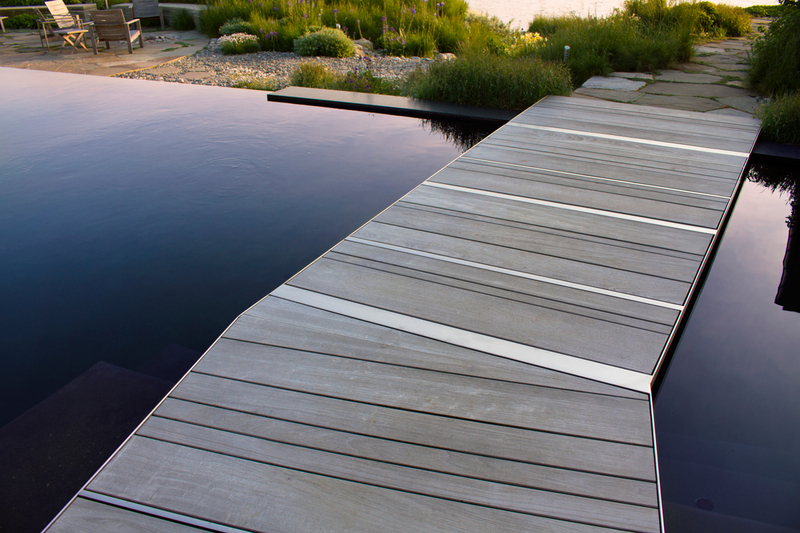 Fabricated of hardwood and stainless steel, the span of the Modernist Bridge separates the spa from the swimming pool. An internal sub-structure has allowed for a slim side-profile. 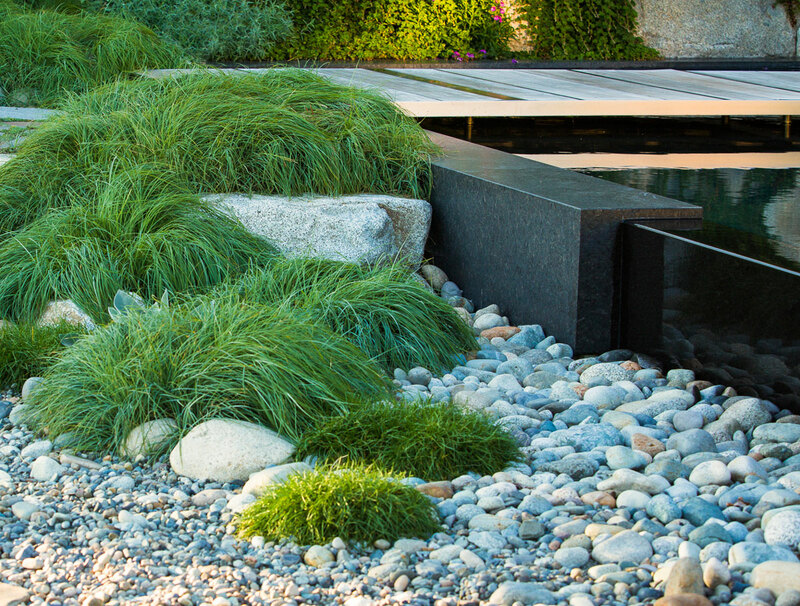 Boulders, resting within the pool emerge from water. 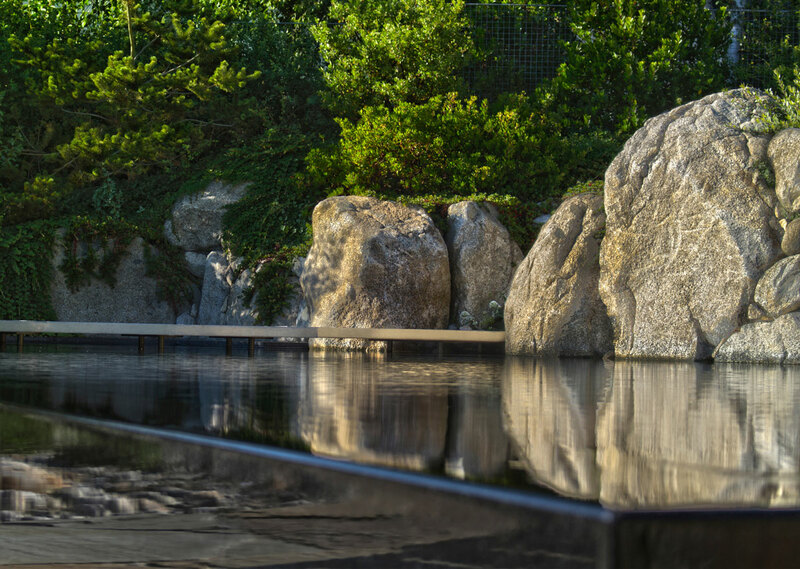 Grounded and timeless, they contrast with the mirror-like abstraction of the pool. Underwater, hands and toes can explore a world of nooks and crannies. A dialogue between organic, inorganic, and texture. 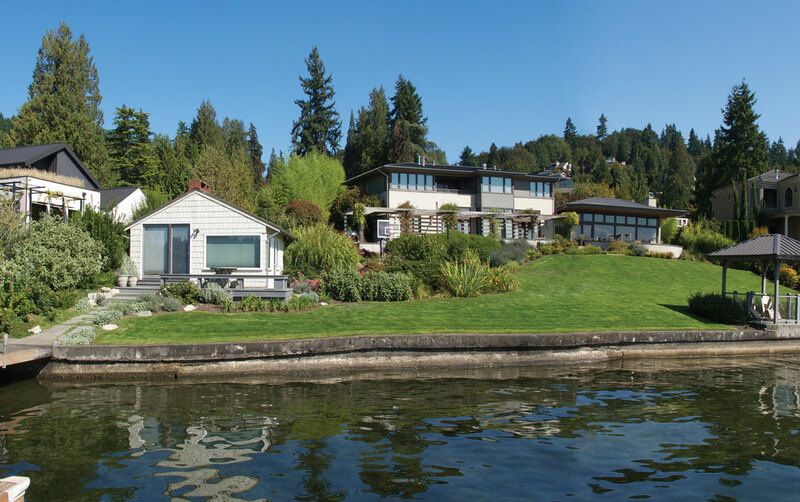 Note: the neighbors’ open-structure boathouse has subsequently been removed. 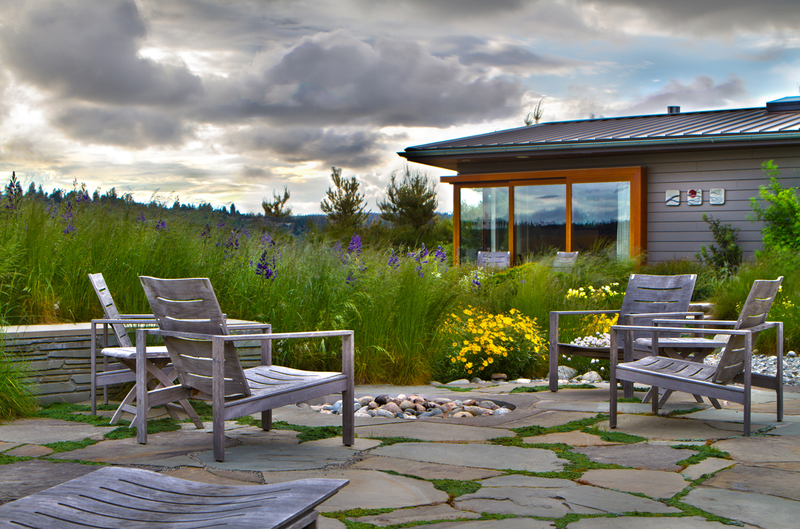 The recessed Pool Terrace, set within the landform of the meadow, provides extra seating along its circular edge. 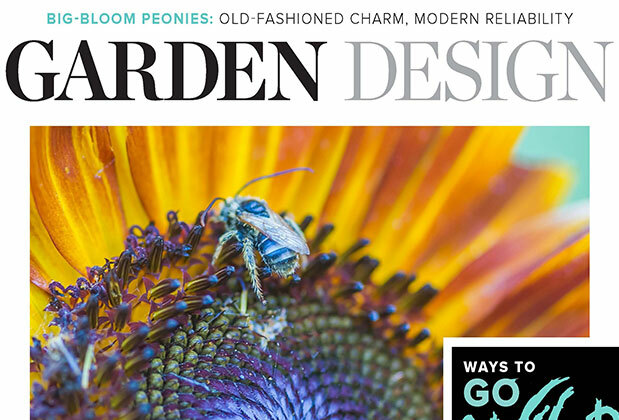 At the meadow’s periphery, plantings start to transition to non-native ornamentals. The foliar effects of Hair Grass persist well into the fall. 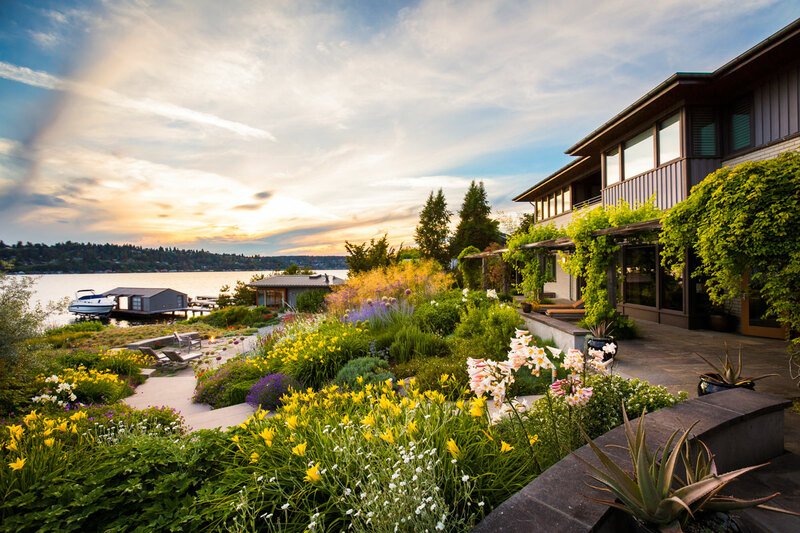 At their floral peak, ornamental plantings up close to the house glow at sunset. Erupting with color, fragrance, and structural interest, the display is timed to coincide with a period of numerous social gatherings and frequent use. 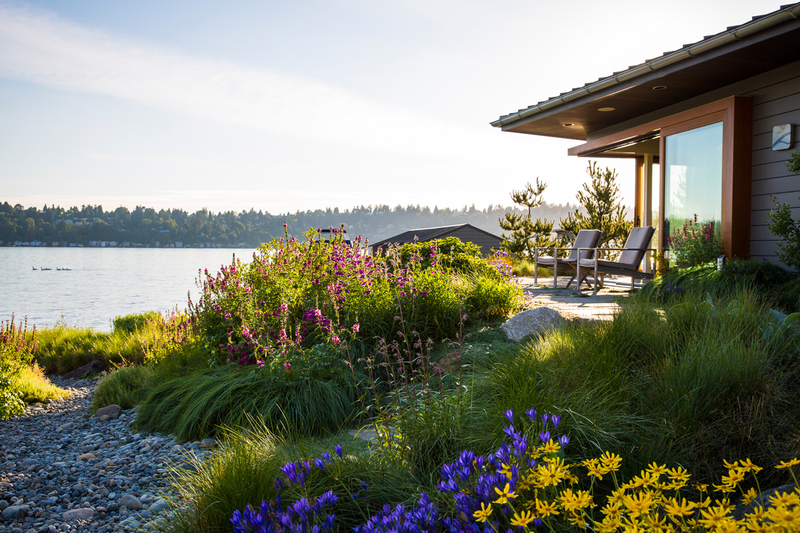 A spring trip to the ﬂowery grasslands of Yellow Island Preserve in the San Juan Islands provided an opportunity to engage the owners of A Shoreline Re-Imagined and their family with an endangered and very beautiful NW native landscape.